8 GPM Hot Water Pressure Washer With A 24HP GX690 Honda Engine, General Pump And Becket Burner! This 8115PRO-30HG Pressure Pro Pressure Washer Has It All! For a limited time, we will include a certificate worth $200 towards an upcoming Contractors Foundation business workshop. Here's your opportunity to save hundreds with our everyday discount prices when you order your new pressure washer from Sun Brite Supply of Maryland. These machines ship to you direct from the factory, fully run-tested and ready to perform your next cleaning job. 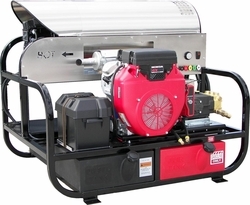 Similar to the 8012PRO-30HG with an 8 GPM General Pump, 3000 PSI) but this unit comes with a 120-volt burner and 2500-watt generator included. NOTE: Generator not for use for other electrical needs. It provides only enough power for the burner alone.